"House prices have come in a touch lower than we had forecast. We have also lowered our projection on the level of house prices about 1 percentage point in this forecast. Taken together, those lower equity prices and the lower house prices take 0.1 off growth in 2008 and 0.2 off GDP growth in 2009." Yeah, a touch lower, and reducing growth by 0.1 percentage point in 2008. This is pretty amazing stuff. It's almost as though they didn't have access to the data showing that house prices were already plunging. The other item that is amazing in these transcripts is that no one seems to know about the Census Bureau's data on housing vacancies. Vacancy rates of ownership units were already about 50 percent above normal levels by the end of 2007. The vacancy rate on rental units was about 30 percent above normal levels. What did the Fed folks think this implied for house prices? Incredibly, the first mention of vacancy rates in the transcripts doesn't come until June. Maybe someone should give the FOMC a short lesson on government data sources. If they had seen the vacancy data they would have even less excuse for being surprised by the plunge in house prices, unless they also need an intro course on supply and demand. The transcripts tell a story where the FOMC is seeing the economy collapse around it and is largely clueless to what is taking place. In fairness, there was little it could do to prevent the collapse at that point, but it is still hard to believe that people who are so ignorant of the economy are able to get paid for this work. 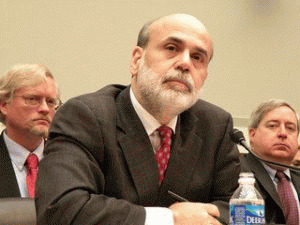 "Even so, Bernanke thought the Fed had probably done enough, according to newly released transcripts. So he recommended that the central bank leave its key interest rate unchanged -- a move the Fed would come to regret." Really, the Fed came to regret not lowering the federal funds rate in September of 2008? What difference exactly would this have made in the financial panic and the collapsing of the housing bubble? If we had lowered the federal funds rate to zero at that point can anyone think that the subsequent set of events would have played out very differently? That's absurd on its face, but I suppose it would at least mean that the FOMC members were not oblivious to the fact that the economy was sinking all around them. As it is, these transcripts should make readers furious that the FOMC members were getting big paychecks for their work and will enjoy fat pensions in retirement. Unlike workers in Detroit and Chicago, they did mess up on their job, big-time. Read em and weep. Since some folks asked, of course I saw the recession in 2008. I had been warning about the bursting of housing bubble causing a recession since 2002. See here, here, and here for a few of my columns from 2008. And the material on the housing bubble is here. Seeing this one coming was easy for folks who understood the economy. Unfortunately, it seems that not understanding the economy was, and perhaps still is, a job requirement for holding a top policy position.